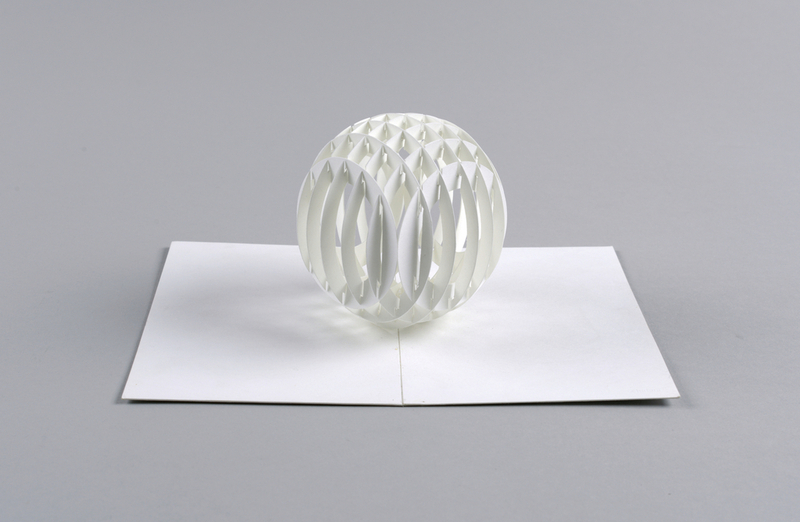 This cut and folded paper sphere created by Masahiro Chatani in 1980 is a complex example of “origamic architecture,” a type of kirigami (切り紙)—from the words kiru (to cut) and kami (paper). Developed in the early 1980s by Chatani, Professor of Architecture at Tokyo Institute of Technology, and his colleague Keiko Nakazawa, origamic architecture sculptures range from the relatively simple geometric patterns found on three-dimensional, pop-up greeting cards to complex renderings of building façades executed with the intricate cuts of a special knife. Masahiro Chatani, Origamic Architecture of Masahiro Chatani (Shokokusha, 1983): 111. While origami sculptures get their three-dimensionality from folds, artists shape kirigami works by cutting and folding paper. Both demand great meticulousness and expertise. Chatani used several sheets of paper to design this sphere, which is made of two perpendicular rows, each with seven parallel paper rings. In order to create the arch, Chatani gradually increased the diameter of the paper rings towards the center of the sphere. Precisely cut grooves on the external or the internal edges of the rings allow them to interlace, creating a complex but stable sphere. Adding more complexity to this precise structure, Chatani designed the sphere so that it folds flat into itself, just like a pop-up card does when the card is closed. Folding the leaves attached to the base of the sphere collapses and expands its form. Masahiro Chatani, Origamic Architecture of Masahiro Chatani (Shokokusha, 1983): 55. This delicate and dynamic sculpture is a dramatic, minimalist, monotone, and zen-like rendering of a classic form. It engages the viewer to contemplate dynamic negative and positive space, challenging our visual perception of changing geometry. While the sense of sight is important to evaluate the complexity and illusionistic aspects of the form, touching the sphere to collapse or expand it reveals a deeper exploration of its delicate folds and cuts.